What happened to the good old days when rugs were, for the most part, wool face-fibers? Most of these fibers are not new – but are new to rug production. What do they look and feel like, and how do we clean them? What is a soy rug? 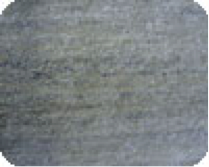 (Image I) This is a very high-end and expensive designer fiber which has only recently been used for rugs and carpet. A Shanghai-based scientist, Le Guanqi, after 10 years of research created a process of turning the leftover plant waste material from the soy bean into a textile fiber. This fiber is now used to make custom tufted rugs and wall to wall carpet and other textiles. The fiber feels like a cross between cotton and linen – very soft, lustrous, with a natural sheen. However, the sheen and soft hand can be affected by wet cleaning. Dry cleaning will not drastically affect the look of the fiber, but of course is not effective on soiled carpet. The key is regular maintenance cleaning – not letting the rug become too soiled between regular low-moisture cleaning. 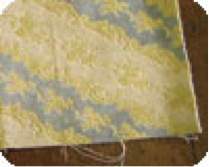 Banana silk is another new fiber to area rug production. This fiber is also known as abaca and Manila hemp, used for centuries for rope and textiles. It is a type of palm in the banana family (musaa textiles), not the cannabis hemp. The fiber is extremely soft, warm and lustrous, with the appearance of silk; however, it does not contain silk. Wet cleaning of this fiber may cause loss of sheen, particularly if it is aggressively cleaned. Proceed with caution. Jute has been used for designer rugs for some period of time. What is new, according to the Bangladesh Jute Research Institute, is that, “Jute yarn is processed to have a wool-like feel. It is much warmer and cheaper than wool.” It does feel like wool – it fooled me by just touch (Image II). But it is a cellulosic fiber and will brown unlike wool. It also does not have the resilience of wool. If in doubt, do a burn test. Bamboo has been hot for a few years now as a hard floor material. You will see strips of this material made from the hard outer shell bound into area rugs. They do roll up for transport and have an attractive natural look. I do not see too much opportunity for cleaning here, as they are really a hard surface that could be mopped by the consumer. However, bamboo can be made into fabrics (like shirts, towels, pants) and yarns for rug production. Bamboo is regenerated to form fibers, as rayon is made from cellulose. Look for more textiles made from bamboo, particularly as it has a “green” appeal. 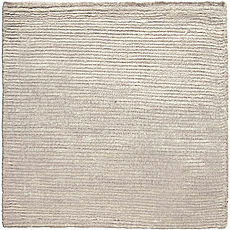 Linen comes from the flax plant and is not new to textiles. In fact, the Egyptians were famous for their extremely fine woven linen fabrics. What is new is that more and more linen is now used for designer rugs and wall-to-wall carpet; some products are selling for $500 per yard installed (Image III). Linen has a great look and sheen to it when new. Because it is a plant-based fiber, it is prone to browning and shrinkage. If woven-linen is installed wall to wall, it can be a disaster for the untrained cleaner who attempts an invasive cleaning method. The textile should have been protected when new. If not treated with a fabric protector cleaning and spot removal will be a challenge. 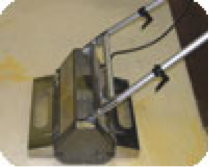 Low-moisture cleaning – done about every six months. Absorbent compound method (right) or bonnet cleaning with a non-aggressive agitation system is the safest. The rug cannot be allowed to become soiled or stained. Careful pre-cleaning inspection and qualification of the rug with the customer. Also, inspection of the installation is a must if the product was installed wall to wall. Because these designer textiles are of such a high cost, you may find the best job you ever did was the one which you did not touch.